Saint-Louis' characteristic colonial architecture along with its regular town plan, its location on an island at the mouth of the Senegal River and the system of quays, gives Saint-Louis the distinctive appearance and identity that have raised the Island to the rank of world heritage. Saint-Louis was the capital of the French colony of Senegal from 1673 until independence in 1960. From 1920 to 1957 it also served as capital of the neighboring colony of Mauritania. A Special hello to bob! I visited Ile St Louis in Dec 2003. 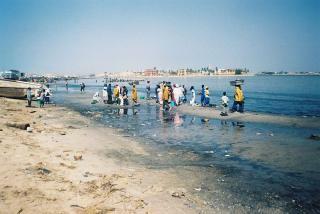 Ile St Louis can be reached by a short ferry ride from Dakar. The ferry is a bit of a challenge as you'll be constantly harassed to hire a guide or visit a souvenir shop. The slave fort itself is open for visits and although colorful in pink plaster and brilliant flowering shrubs, it has a sour aura of sadness about it. We were lucky to have a tourguide give a 20 minute soliliquy (in French) on life at the fort. His dramatic and authentic presentation was worth the trip alone. The island remains inhabited with friendly french speaking Senegalese and the colorful french style colonial houses and beautiful children love to be photographed. (Ask first). There are a few pensions on the island but plenty of hotels in Dakar. Although we were constantly harassed, we never felt unsafe. British Military victories over France: Captured in 1758 during the Seven Year's War :- "The sudden arrival of British troops took the garrison completely by surprise. On 1 May they surrendered the fort, and the resident traders swore allegiance to the British. Not a single Briton had been killed in the taking of the settlement." Was kept by Britain under the 1763 Treaty of Paris but was lost again during the American War of Independence. Built in the 19th Century: Founded in 1659 by French traders on an uninhabited island but remained little more than a fortified factory until the English departed in 1817 after a 16 year occupation, leaving it in ruins. A "plan d'urbanisation" was prepared in 1828 defining the regular street layout etc and in 1854 a new governor, Faidherbe, oversaw the completion of the ensemble with further large scale projects. Built or owned by French: Saint-Louis was the capital of the French colony of Senegal from 1673 until independence in 1960. Located in a Former Capital: It has variously been capital of Senegal, Afrique Occidentale Fran?aise (AOF) and Mauritania when that entity was regarded as being separate from AOF.